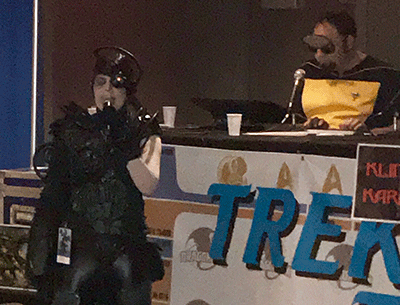 After a full and successful launch of the 2017 Trek Track at Dragon Con, team Star Trek welcomed fans into the Hilton Galleria Friday night for “Klingon Karaoke.” A steady stream of fans signed up to perform, and with each song, the crowd became more and more engaged. Performers had obviously planned ahead, time and again tying their song selection to their persona. Among the many outstanding renditions showcased during the evening several stood out, including the Borg drone “1 of 3” who sang Three Dog Night’s “One” and “Spock Vegas” who sang Paul Anka’s “My Way.” The late Frank Sinatra, who gave us the definitive performance, would have been proud of Spock Vegas, who had clearly studied the master crooner. By the time the final note ended, the entire room was on its feet, giving him a standing ovation. Like all such events, the energy level in the room ebbed and flowed. Early in the evening, sensing that the audience wasn’t fully with him, a young man worked the crowd during his performance. Singing Nikki Chinn and Mike Chapman’s “The Ballroom Blitz” (which he knew by memory) he walked, skipped and ran the length of the room, calling upon the crowd to “come on” and “have fun!” during the instrumental interlude. A continuous flow of fans moved in and out of the venue with the crowd regularly joining in on the chorus but a real highlight was a performance of “Space Oddity.” Trek fan Zack performed the David Bowie song, originally recorded in 1969, with a slight variation, substituting “Voyager” for “Ground Control” throughout. He and the crowd drew energy off one another. By the second verse, the entire audience was rocking, and Zack’s karaoke became a huge sing along. As this reporter headed out, the DJ and crowd rocked on into the night.